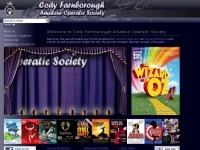 The Cody Musical Theatre Company is the premier amateur society providing high quality musical and operatic productions for the Rushmoor and surrounding area since 1920. Registered charity number 257135. A profile of Cfaos.co.uk was found on the social network Facebook. The web server used by Cfaos.co.uk is located near the city of Gloucester, Great Britain and is run by Fast Hosts LTD. There are many websites run by this web server. The operator uses this server for many hosting clients. In total there are at least 137 websites on this server. The language of these websites is mostly english. The websites of Cfaos.co.uk are served by a Nginx server. The markup language of the website is XHTML 1.0 Transitional. The visitor analysis software Google Analytics is used to analyze the visitors of the websites. Both the inclusion of the website in search engines and follwoing of its hyperlinks is explicitly allowed.